It all looked so simple. I had the video equipment set up and rolling. Assembled the (to my knowledge) first ever WiFi-Throwie. But those in the know might spot the problem right away in this picture. Yes, the CR2032 battery totally caved in under the 70mA load of the ESP8266 / ESP-01 module. And I should have known. The typical discharge rate for a CR2032 is 0.2mA. I need about 350 times more, well knowing this wouldn't last for long. I then learned the hard way that the internal resistance is obviously way too high. TI has a document here, where they tried discharge currents beyond the recommended 15mA maximum. But they wouldn't go beyond 30mA. This blog article also confirms that. So it's back to 18650 rechargeables. Or quite possibly CR123 if size matters. EDIT; Ordered a CR123 and suitable battery holder today. I'll keep you posted. 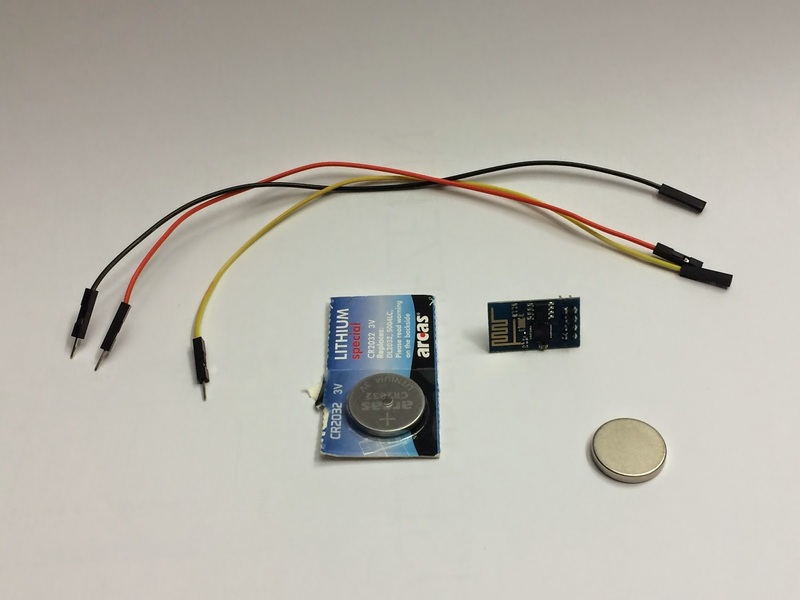 At site tim-jagenberg-info is article "Low Power ESP8266 – Sleeping at 78 micro Amps"
Yes, I've read that. But decided against going down that road: I have the module running in softAP mode, so it sends the SSID 10 times per second and is always ready to receive connections. That sleep-mode approach is great for checking sensors and connecting to a server in case of an event. If you manage to get it working in AP-mode, please let me know. i have a box full off old Nokia ion cell phone batteries i just have to bye one off that modules and give a trye. According to the WIKI, The module has a 3-3,6V operating range. If your batteries are in that range, you should be fine. Yeah, that would work. I too have boxes of assorted lithiums but mostly 18650s and suchlike. A good tip is to gut them out of camera batteries as these are usually 250mAh around CR123 sized cells and are cheap enough from clearouts at retail outlets in the bargain bins. I've also found that many "dead" Nokia batteries can be revived by feeding 3V@20mA into the top cover under a sticky label, then they come back to life. I have ordered a CR123 and holder and will try that. This would make the whole thing more "throwable". I use a 1N4001 diode to drop 0.6v along the way when running the ESP-01 on a 18650, just to stay within specs. I was going to suggest using a car battery, and going for the LARGEST wifi throwie ever! But with that throwie you'd make quite an *IMPACT* ! hello sir!! can we use this battery for node mcu or ESP8266 projects?? No. I use CR123 batteries instead. They work great.